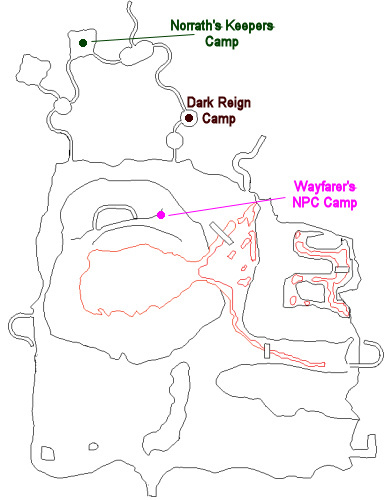 This raid task begins with Lieutenant Ekiltu Verlor (click for map image) in the Norrath's Keepers camp of the Lavastorm Mountains. You have been assigned the task 'Goblin Dojo'. It is peculiar that the goblins in Thundercrest Isles have issued a challenge to Norrathians. As much as we don't often bend to threats and arrogance, we are curious what the outcome of this challenge might be -- and it's better that we find out and be prepared for it, rather than the Dark Reign. Be on your guard. It could very well be a trap. Approach the Storm Reach Sensei, who opens the doors to the Dojo and enters. Six players must be inside the Dojo before this event activates. Don't enter the Dojo until you're ready. In this event, you will be fighting against waves of goblins. Six people must be present in the dojo in order to activate the event. The Master of Rage shouts, 'I hate you! I will rend you into bite-sized chunks of flesh and feed them to the puma!' Rage's face darkens with blood and flecks of spittle fly from his mouth as he pants and stares at his enemies. - Master of Doubt: hits 240-1020, average 500, ~101,000 hitpoints, casts "Doubt" and "Mental Discord"
- Grandmaster Beetle: hits 150-850, average 510, ~152,000 hitpoints, casts "Whirling Beetle Strike"
- Grandmaster Snake: hits 120-730, average 280, ~126,000 hitpoints, casts "Venomed Mist"
- Silk: hits 30-420, average 210, ~202,000 hitpoints, flurries, casts "Corporeal Torment"
Now, Storm Reach Sensei attacks. Storm Reach Sensei hits for a max ~3,100; has ~336,000 hitpoints; casts "Whirling Smash" and "Fist of Mastery"; and single-target rampages. Storm Reach Sensei has been slain by _____! Storm Reach Sensei's corpse falls slowly to the floor, a small smile on his face. You've done well. Thank you for representing us. at level 100 this is a joke, all mobs down within 20 seconds of them activating. 6+ players need to move forward into the dojo before it begins, and then before you know it, its over. You need SIX in the INSTANCE zone, 1. 100 Rouge 2. 100 Wizard 3. 100 Druid and 4. 100 Warrior and a 5. 100 Cleric and maybe a , humm, lets see adds a 100 RANGER for sure. wtf! need 6 players, mercs wont work. he then walks into the room, stopping at the very front. Tried entering with 3 and it would not work, he just stood there at the front of the room. Most likely need 6 as he says. You must have 6 players in the Dojo for this event to begin. can you do this with 3 toons and 3 mercs? Mercs will be suspended upon entry of this event. Went into mission with 6 people and nothing happened. Couldn't get Sensei to speak to us. However, only one entered the actual dojo room. Does anyone know if it is bugged or if it can be done with 6? Do all 6 have to enter the dojo room? He actually says you need at least 18 to do it. Nevermind. Got this mixed up with another mission. He has a VERY high AC ... but he seems weak to weapons. I've seen higher damage numbers after crits for both slash and blunt weapons, didn't get any crits when I swapped to a piercer so cannot verify that weapon type. You do so little damage to him because of his AC, though. Wave 1: presumably three of the five mobs -- I'll update it later when I get the info ;).